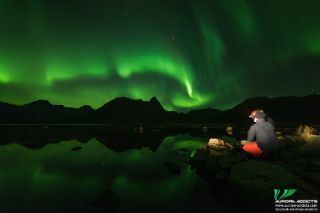 This gorgeous photo was taken in Norway on Oct. 26 by Chris, one of the "Aurora Addicts." The "addicts" run a company that offers trips to see the northern lights and other sights in Arctic Norway. A moderate geomagnetic storm in Earth's magnetic field created some luminous auroras as far south as the northern United States last night. Space weather refers to the stream of radiation and powerful particles ejected into space from the sun. The Earth is largely protected from space weather by the planet's atmosphere and its magnetic field. When solar material hits the magnetic field and causes a disturbance — or what's known as a geomagnetic storm, according to the National Oceanic and Atmospheric Administration (NOAA) — it can create the natural light show known as auroras. Night sky photographer and northern lights tour guide Marianne Bergli caught this image of the auroras on October 26, 2016 in Troms, Norway. On Tuesday (Oct. 25), NOAA's Space Weather Prediction Center (SWPC) sent out an alert for a level G3 (strong) geomagnetic storm. The scale for these storms goes from G1 (minor) to G5 (extreme). Early this morning (Oct. 26), the storm was listed as a level G2 (moderate). Prediction maps showed that the regions mostly affected by the storm were the northern contiguous United States, southern Alaska, northern Europe and Russia. Skywatchers captured images of the auroras in Finland, Norway, Denmark and Sweden, as well as Wyoming and northern Wisconsin. The aurora borealis (northern lights) might have been visible in regions typically too far south for the lightshow, including Washington state, Idaho, Wyoming, South Dakota, and Iowa. Today, the SWPC predicts additional auroras, but only in very northern latitudes (including northern areas of Canada, Scandinavia and Russia, and most of Alaska) and over Antarctica. Geomagnetic storms can create problems for GPS and communications satellites, and powerful storms can even cause power grids to surge. They also pose a radiation threat to astronauts living outside Earth's protective layers. (The International Space Station is equipped with shielding to protect those on board from solar storms.) For these reasons, many scientists are currently working on plans to better predict, monitor and understand space weather.